It is easy to install “PRIMAVERA” so the construction cost is reasonable. 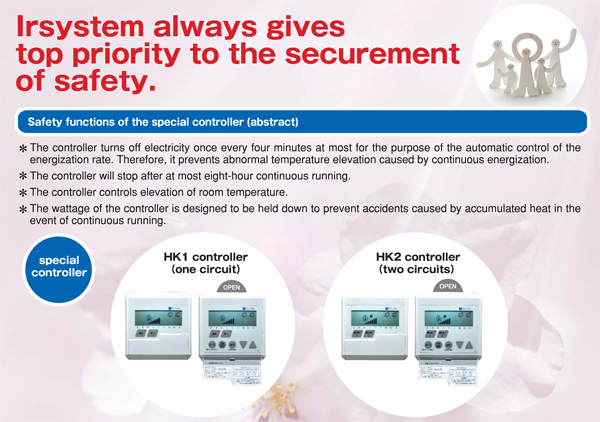 The running cost is also reasonable because the special controller controls electric supply equipment automatically. It does not cost high as you assume. It is the ultimate energy-saving floor heating having no useless consumer electric power. Even if foundation floor finishing of installation place for floor heating constructs carefully, there form few protuberance, dust and burr of foundation material certainly. 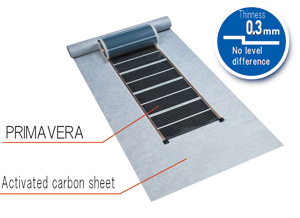 Activate carbon sheet protects floor heating sheet from these and it prevents the short circuit accident based on flaw from happening. Moreover, active carbon sheet is the effect of protection against/deodorization/adjustment of humidity and absorbs the chemical matter. Also, in case of putting together floor heating sheet, it amplifies far infrared radiation. Floor heating is various types. However, taking very seriously safety, laying active carbon sheet, it is PRIMAVERA only. We are particular to comply with the wishes of customer. Are of heating element (black belt part) on sheet is taken up a lot of space as thoroughly as possible. In other words, it reduces the number of heating watt per unit of black belt part. Therefore, even if it turns on the continuous electricity to sheet by controller failure, moreover the object that is generated the heat closing in cushion to heating part has stepped onto it, it is the structure that never occur the carbonization accident. It is possible setting of power source OFF for 0 to 24 hours freely. About unusual accident of turning on continuous electricity too, it has the function of automatic stopping at set time. It has the function of abnormal temperature sensor (option) and stops automatically at unusual high temperature accident. Our controller turns off electricity once within the longest 4 minutes surely to control automatically electricity rate. Therefore, it does not cause the abnormal heat-up based on the heat closing by continuous electricity. Controller manages the rise of temperature in room. When the room temperature rises to more than fixed temperature, it stops power source automatically. Relay of controller is service-life. When relay part deteriorates, fixed abnormal operation occurs. But our controller senses its abnormality and it has the automatic stop function. Electricity part of sheet is the double structures of copper foil belt and silver foil film belt. Copper foil belt forms “burr” such a sharp saw edge on belt end part in manufacturing process. If this contacts to black carbon part directly, the “burr edge” flaws to this and do not electricity. Therefore, it applies the silver foil film belt to copper foil belt part to protect black carbon part. Consequently, spark accident does not occur by the cut of black carbon part. Moreover, it is no electric resistance of electricity part and keeps out energy loss the utmost. It can change freely the continuous electricity time after switch ON. Rising time of surface temperature differs remarkably by the difference of finishing material (example: 10mm thickness tile and cushion floor). So, it conducts the necessary low continuous electricity in proportion to finishing material and reduces the useless consumer electric power, and then it defends the generation of closing heat. Temperature of winter differs by each are completely. And, each man has a sense of heating temperature. For that purpose, our controller has the function that can change the range of setting temperature belt freely. And so, it can set the proper temperature not to hurt feelings with high temperature. If the sheet occurs abnormal unusually, the abnormal electric current flows surely. Our controller senses it and has the function of automatic stopping. Most of nonconformity occurrence is due to the construction of inexperienced construction store. We go to job site surely and explain the construction method to construction store of beginner. Active carbon sheet of thickness 1mm is laid to the construction surface of film heater surely. Consequently, it covers all protuberance of foundation and reduces the damage of film heater, and then the prevention of short circuit is possible 100%. In case of doing OFF/ON operation within 30 minutes after power ON, controller returns to the temperature setting condition at the last time OFF and does not repeat 100% electricity of 30 minutes again. Therefore, it does not cause the continuous electricity accident by man. Having HA terminal, it can turn off power source by telephone line even if you forget the switch OFF at time of going out. property quick house sale sell your house quickly.